Welcome to Otryad LED store, we are always dedicated to provide good quality products and service, any problems of lights, please contact us freely, we will service you till satisfaction. New generation LED chips technology, much brighter than tradition 5W chips LED. Special ratios of Blue/Red/White Spectrum which based on 10 years of research and testing can be fully absorbed by the plant to photosynthesis,Best for fast growth and high yield and make sure a high THC in harvest. All LEDs with a zener diode to ensure one LED out the rest can still working very well. lighter than other general led grow light panels,against friction, pressure, with long service life.high compressive strength and compression strength. 1 set of teel hanging kits. Efficient Growing: low power consumption but high luminous efficiency, this 500W indoor grow lights utilizes high quality chips, ensure high luminous efficiency & light penetration, maximizing the plants' absorption of the lighting. Compares to traditional 250 watt HPS/MH while consuming only 136 watts! Perfect for a 2x2' growing area at 24" height (Max coverage 3x3'). Full Spectrum: Supomvo 500W LED Grow Light with full spectrum,include 430nm, 450nm-470nm, 620nm-630nm, 740nm, white.This grow light emits the wavelength of light which can be fully absorbed by the plants from seedling to harvest, good for both indoor plants,veg and flower. 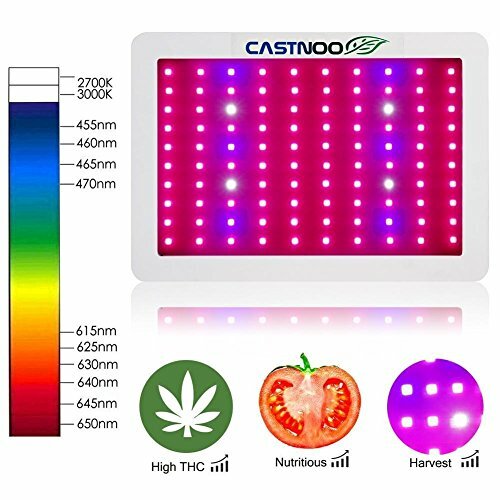 Only the OTRYAD is the official authorized distributor of Castnoo on Amazon. All of our items are manufactured by CASTNOO private mold. There are logo on the each item, which can be seen from the images obviously. Those buy from other sellers are fake! If you have any questions about this product by Otryad, contact us by completing and submitting the form below. If you are looking for a specif part number, please include it with your message.